Maria Cooper Janis—the only child of legendary screen actor Gary Cooper and his wife, Veronica (Rocky)—is one of the few people who intimately remember the 20-year friendship between her father and Ernest Hemingway. A painter and resident of New York City, Janis will be in Sun Valley the weekend of Sept. 28 to Oct. 1 to host the world premiere of the feature documentary "Cooper and Hemingway: The True Gen" during the second annual Ernest Hemingway Festival. Maria will introduce the documentary with film historian and writer/director/producer John Mulholland, on Thursday, Sept. 28, at the Sun Valley Opera House. Also in attendance will be her husband, Byron Janis, widely considered to be one of the 20th century's greatest classical pianists. Fittingly, he composed and played the score for the movie about the father-in-law he much admires but never met. "I'm very excited about the film, of course," Maria said during a telephone interview. "That is a major current event. It's not just reminiscing. It excited me a lot when John (Mulholland) brought me the idea. I've been a part of three other more traditional documentaries. This is very creative and new in terms of something that is factual and real." Maria was a consultant on the film as were Hemingway sons Patrick and Gregory Hemingway, and son Jack Hemingway's widow, Angela Hemingway. Gary Cooper and Ernest Hemingway met in 1940, years after "Coop" was cast in the 1932 movie version of "A Farewell to Arms." In 1943, he again played a Hemingway hero, Robert Jordan, in the film version of "For Whom the Bell Tolls." The two men became close friends and remained so until their deaths, which came the same year, 1961, just seven weeks apart. Maria well remembers the two families spending time together. "They were very different people," she said. "How could they be friends? Both men had a basic similarity about things that were really important, like with a marriage. The law of complementary is very important. There is a basic understanding of where each other is. Yes, they shared love of nature, hunting and fishing, and they shared the challenges that an outdoor sporting life puts on a man. Their sensitivities were different but they respected each other. Robert Jordan was created with Gary Cooper in mind. Hemingway perceived my father to be what a man was and what a hero was." A Montana native, Cooper truly was a Westerner. He grew up on a ranch near Helena and his early film work was as an extra in Westerns. He was renowned for his understated acting style that could also smolder with an intense individualism. In f act, it was his spare way on screen that seemed to complement Hemingway's similar way with words. "One of the things my father always stood for was 'keep it real and keep it genuine,'" Maria said. "This story is really something that gives the opportunity to weave in my father's life, and Hemingway's too, that you don't always touch on in a documentary. It makes me very happy, I think it works. John has done a magnificent job by taking two very different people and showing the average lay person how that friendship worked and meant in a larger context." Maria, who has spent time in Sun Valley, recalls nights at Trail Creek Cabin, skiing, and how one year her parents took her out of school to live in Idaho. "I went to school in Ketchum and learned how to make really effective spit ball pellets from aluminum wrapping of gum. We had a ball. My family was very close, so I got the best of all of that. 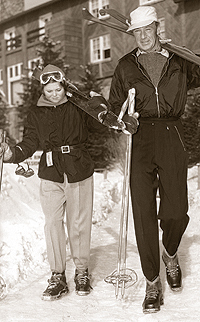 My first steps on skis were with Marty Arrouge (one of the resort's original instructors) on Dollar Mountain. And I christened the little lift on Dollar. It was very funny. The celebratory liquid was milk but the milk had frozen, and it wouldn't break. "That's the Sun Valley of my childhood." For Maria, memories of the Hemingway family and her own inform her ideas of the two men and the place where they shared the most time. "If you strip away the celebrity of today, the big houses and the lavishness, it was a basic appreciation of the place—nature, the good friends one had, the huntin' and fishin', the skiing, which was wonderful, bowling—it wasn't a status symbol then. I wasn't aware of it obviously, I was young, but you went there because that's where your friends were. It was different. "Those two men—that's what they appreciated—they let them be who they were. We were close friends of everyone in the ski school. We'd all hang out at Trail Creek. There was bond, and it was never 'I'm a star, you're a ski instructor.' Sigi and Peggy Engl were very dear, close friends. There were some great evenings—if the walls could talk."